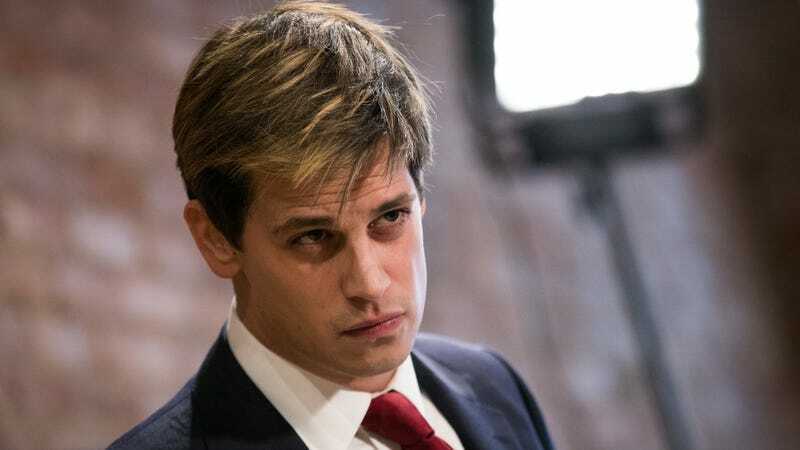 Yesterday, BuzzFeed published an exposé on how soulless alt-right troll doll Milo Yiannopoulos solicited ideas and advice from white supremacists and neo-Nazis to help grow Breitbart into the mainstream hate influencer it is today. That report also contained exchanges with other journalists, ones who don’t nominally run in white supremacist circles, but who fed tips and pitches to Yiannopoulos and his ghostwriters, praised his misogyny, sicced him on left-wing writers, and generally palled around with him. And damn it if I wasn’t shocked. After the report was published, evidence of these and other liberal journalists buddying up to Yiannopoulos (his Twitter handle was @Nero before he was banned) and other alt-right ghouls like Mike Cernovich, who spends his days spreading insane conspiracy theories online, and Ann Coulter, famous for being a racist hyper blonde lady and for bombing on Comedy Central, wasn’t hard to find. It had all been out there in the open. Is there a word for when you feel embarrassed about your naïveté? Because I feel dumb as hell. I assumed that when Nuzzi and her down-the-middle cohorts wrote things like this glowing profile of Mike Cernovich in New York magazine, they went home and immediately took a hot shower to wash off the stink. I didn’t realize they were just writing about their friends. Maybe these reporters think associating with Pepes makes them look like they know something everyone else doesn’t? That they’re cool enough to get into the club? That this is all just a no-stakes game that ends with a few more Twitter followers? Maybe they feel subversive? Maybe they’re just so caught up in a big media circle jerk that their brains have been jostled out of their ears and they don’t realize or care they’re enabling the work of literal white supremacists? I’m not sure why anyone would want to be best friends with Ann Coulter. I do know that I feel like a moron for not realizing sooner that opportunistic dopes and morally bankrupt frauds walk among us.